HARARE — Zimbabwe appealed on Tuesday for $613 million in aid from local and foreign donors to cover food imports and help with a humanitarian crisis after a severe drought and a cyclone that battered the east of the country. 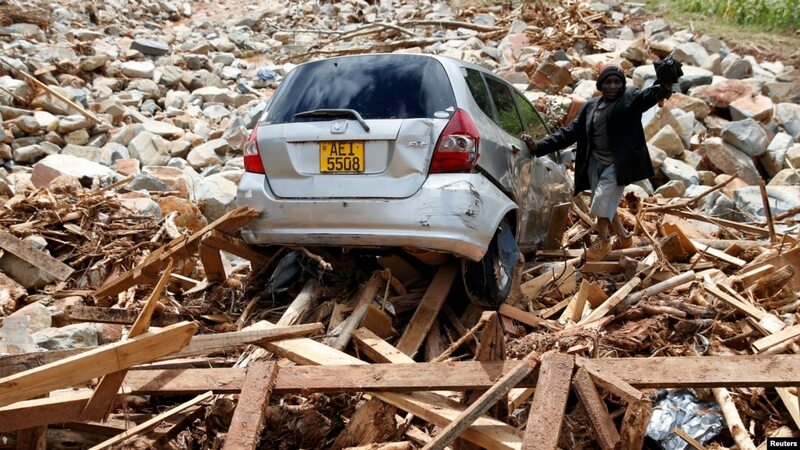 FILE – A man gestures next to his car after it was swept into debris left by Cyclone Idai in Chimanimani, Zimbabwe, March 23, 2019. The situation was worsened when Zimbabwe, along with Mozambique and Malawi, was last month battered by Cyclone Idai, leaving hundreds of thousands needing food, water and shelter. Meanwhile, Information Minister Monica Mutsvangwa said the cabinet had hiked the maize price paid to farmers by 86 per cent to $232 a tonne and maintained a subsidy for millers in a bid to keep the price of the staple maize meal down.